KOSUN recently launched a new set of oil sludge treatment equipment to help solve this problem and actually effect in the working site. As many countries care more about the environment protection and considering the new Environmental Law, the environmental regulations are getting more strict for oil field-related companies. Free discharge of oil sludge will not be allowed any more making oil sludge treatment become an urgent need for many companies nowadays. 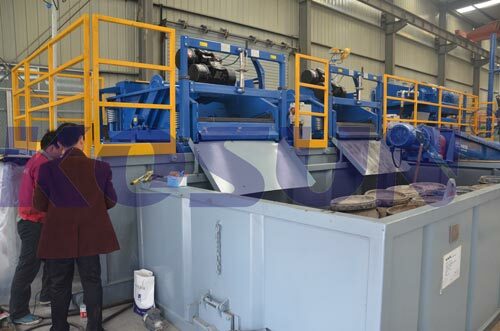 KOSUN (China Oil Sludge Treatment Equipment manufacturer) recently (2017) launched a new set of http://www.kosuneco.com/archives1391.html oil sludge treatment equipment to help solve this problem and actually effect the working site. What is oil sludge? Oil sludge is oil mixed with soil. When mixed together they become very difficult to deal with. Oil sludge is mainly from two aspects: Firstly, crude oil from the stratum to the ground and accumulated in all kinds of containers, large tanks and recycling pools and other ground facilities; secondly, oil sludge produced by oil well operations. Oily sludge is mainly derived from oil field mining and sewage treatment plants. In general, the sludge oil content is from 10% to 50%, and moisture content is from 40% to 90%. The ultimate purpose of oil sludge treatment is to reduce the harmful substance. The common oil sludge treatment methods are solvent extraction, incineration, biological, coking, oily sludge profile control, and comprehensive utilization of oil sludge. The results show that the current methods for oil sludge treatment have their own characteristics and scopes of application. As the oil sludge composition is so complex, there is no treatment method that can treat all types of oily sludge. Since 2007, Daqing Oilfield (China) has built nine oil sludge treatment stations, and the annual treatment capacity can reach 3.2 million tons, all the oil sludge had been treated harmlessly. Changqing Oilfield built a Longdong oil field sludge treatment station in 2013 and used the physically and chemically combined methods, the oil content of the treated oil sludge is less than 2%, and moisture content is less than 60%, while the crude oil can be recovered. Xinjiang Fengcheng Oilfield Work Zone uses microbial agents to deal with heavy oil sludge and sludge oil content is reduced from 15% down to below 2% after treatment, which is very good. The current test has been reviewed by the company. Kosun http://www.kosun.com have been exported this set of system to many places, such as United States, Europe, Russia, the Middle East and other regions, and the oil sludge treatment system has good expression by the feedback of our clients. If you need more information about our oil sludge treatment equipment, feel free to contact us.